Having a hard time picking SXSW talks? We rounded up some winners that feature our team. Check them out and vote. Boy, do we love to learn. And we love to share that knowledge. 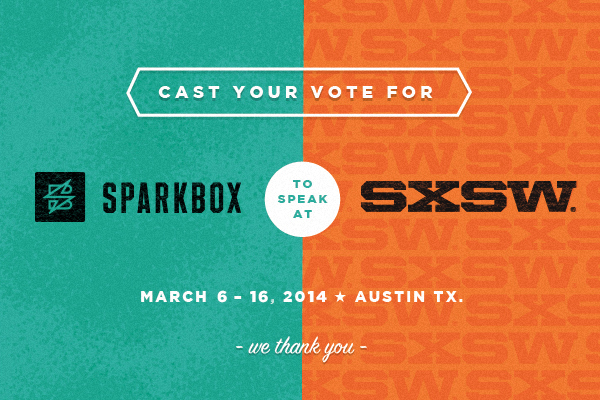 We've submitted some sessions for SXSW 2014. We'd love to have you check them out and vote. It is discouraging that organizations doing great work are often struggling to be profitable. In this presentation, we will dive into different pricing strategies and discuss the good, the bad, and the ugly of each one. We will also talk about the art of estimating, how to work through initial pricing with clients, and what to do when the scope changes. I'd like to see any dedicated person be able to run a profitable business. Figuring out pricing is a big step in that direction. Learn more and vote for Pricing for Web Projects. As more and more people are accessing the web through mobile devices, the desire to create better experiences for those devices is increasing as well. If you work on the web and fancy the feel of a native app - this is for you. Let's explore what we can do with the modern web to make our mobile web apps feel more like native apps, with all the advantages that come with being on the web. We'll dive into browser quirks, touch events, new APIs, speed, and JS performance to give you a better understanding of what your mobile app is capable of. Learn more and vote for Write Web Apps that Look Native. For would-be web developers, getting started in the trade can be an intimidating process. For employers, finding hands equipped and ready to contribute to a team is an equally painstaking process due to a shallow and scattered talent pool. An apprenticeship framework is a great solution for both problems. At Sparkbox, we’re resurrecting this ancient practice, retrofitting it for our fast-moving industry, and we're eager to share the things we've learned on the journey so far. Learn more and vote for Web Apprenticeships. Build Responsively introduces attendees to the mindset and techniques necessary for embracing the fluid nature of the web. The full-day, eight-hour-long workshop provides a broad sweep across the major topics involved in building responsive websites. Across each topic, we will cover a good starting point of best practices, relevant examples, recent industry developments, and challenging hurdles. Learn more and vote for Build Responsively. Web professionals spend their days immersed in the new paradigms of the multi-device web. Yet, even for us, the constant change and adjustments that come with living on the internet can feel overwhelming. So how must our clients feel? It’s time to shed the closed communications and drama of the “big reveal”—and build new systems based on honesty, inclusion, and genuine communication. Reassessing our methods for web design gives the opportunity to develop better process and deliverables, and it also opens the door for reassessing our clients’ role, and how we communicate with them. In this way, our clients will become true partners as we learn to better navigate this strange, evolving digital universe together. Learn more and vote for Working with Clients.